New toolwindow DABC Monitor: For new GSI DAQ framework Data Acquisition Backbone Core (DABC). Allows to inspect all info services registered to any DIM server. Any DABC ratemeter service running on DABC or MBS nodes may be monitored and filled into trending and statistic histograms. This tool is build optionally if environment variable DIMDIR is set and DIM is installed there. Added Support of Solaris with CC 5.x (without RFIO). Fixed different warnings from Solaris CC compiler. Viewpanel menu: "File/Produce Graph From Markers" will generate new TGraph in local workspace containing the points of all Go4markers set in the current pad. May be used to fit function to manually selected positions. Viewpanel: Correct work of marker class in case of superimposed histograms. Now newly created marker will be assigned to currently selected histogram. FitPanel: in Wizard and Expert mode there is now possibility to clone existing model component. Especially usefull in case of TGo4FitModelFunction and TGo4FitModelFormula classes, which require a number of different settings. Mbs event library: Added new event types for future GSI data acquisition framework DABC. a. Mbs API: streamserver connection timeout was not working correctly (leads to hangup of analysis control when no data is delivered from streamserver). c. MbsAPI , for f_stccomm.c file. Fixes problem with connecting 64 bit machine to MBS events/stream/trasnport server. False usage of select() function. h. QRootApplication: in constructor numc argument must be delivered as reference. i. TGo4MBSViewer: status record must be cleared in constructor. b. Small adjustments for the new ROOT (5.17.05) browser. c. Adjustments for modifications in ROOT signal-slot mechanism syntax (ROOT >=5.19/02); this caused viewpanel crash. d. Two ROOT libraries (libTree and libGpad) added to Go4 rootmap file that user Go4 analysis library can be loaded in CINT session. e. ThreadManager workaround for ROOT bug in TThread::Delete() (ROOT bug report 31085): for some compilers, Go4 GUI crashed when shutting down or disconnecting analysis. a. Marker editor: A point- or region marker and its label will pop to the pad foreground when it is selected with left mouse button. Additionally, selection of a marker in the combo box of the editor will let it appear frontmost. b. In superimpose mode selected histogram can be moved on the top of complete histogram stack via new menu command "Select/show histo on top". c. Draw options enhanced: support for TGraph draw modes and TGraphErrors error style. Reorganization of draw options for TH1/TH2. New draw options tool for line, marker, and fill colours of histograms and graphs. d. Menu "Select" to chose active object from superimposed histograms and graphs. f. Improvement in speed of view panel redraw (up to factor of 2). 3. New Zoom toolbar: added buttons for scaling z-axis of 2d histograms. 4. New icons for zoom toolbar and draw options toolbar. 5. New additional draw options toolbar to select commonly used drawing options by buttons (lin/log, line, histo, some 2d styles). The new toolbar is displayed via the RMB options pull down menu. 7. Settings menu: "Show event status" selectable as default pad option. Settings menu: "Statistics Box..." dialog to define default pad options for histogram statistics. 9. Improvement in TGo4MbsFile for partial read of lmd file: Corrected mismatch between first event index and real event number (before: index=event number-1). 10. TGo4MbsFile: now can also read list-mode data of old event formats type 4,1 and 4,2. Event will be converted implicitly into format 10,1 for further processing: User unpack processor gets TGo4MbsEvent with one TGo4MbsSubevent that contains all event data. c. Due to changes in ROOT in many Go4 files includes like TROOT.h, TMath.h, TList.h are missing. Sometimes user should also include these files in user code. d. In latest ROOT TBuffer class becomes abstract, therefore one cannot use it directly in the code. Instead, TBufferFile class must be used. a. for changes in ROOT>v5.14 pad cleanup: Viewpanel with go4 markers on subpads crashed when closed or cleared. b. 1-d histogram drawing. Due to some features of ROOT histogram painter several draw options (lin, barchart and others) not working after TH1::SetSumw2() is called - in there Sumw2 array sum of squares of weights is accumulated. Modification in Go4 code were done to avoid Sumw2 arrays when it not necessary. d. Problems with view panel scaling functionality when build with gcc4.0.x compiler (FC5); fixed. 1. Analsis framework: TGo4EventElement now implements default method Fill() that calls virtual function TGo4EventSource::BuildEvent(). As a consequence, for a simple analysis the user only has to implement BuildEvent() method in his processor class. There is no need to develop a user output event class. Even if a user output event class shall be used, methods Fill() and Init() are not necessarily needed for a standard analysis. Go4ExampleSimple and Go4Example1Step were changed accordingly. 2. Analysis framework: TGo4EventProcessor now implements BuildEvent() and can be used in steps which are only used as handle for event input (branched steps). 4. Parameter editor offers popup menu GetFromFitPanel for embedded fitters to update fitter settings from the current fit editor. Useful for calibration parameters that should be fitted interactively to spectra (see Go4Example2Step). 5. Rebin in GUI. Now when histogram will be rebinned via right-mouse menu or via ROOT graphical editor, rebinning will be kept when histogram will be updated next time from analysis. Many views of the same histogram with different binning are possible. Binning also kept in hot-start file. TGo4Picture has new SetRebinX(), SetRebinY() methods to configure rebinning of displayed histogram. 6. All Go4 macros put into new subfolder $GO4SYS/macros. This directory should be added to entry Unix. *.Root.MacroPath in .rootrc setup file. New macros: savecond.C and saveparam.C to create macros to set conditions and parameters to their current values (see 4.5.6, page 26). a. Access to RFIO root files from Go4 GUI browser was not possible (at GSI), since internal functions of libRFIO.so were shadowed by functions of GSI event lib with same names. Solved by separating Go4 event library package into different modules for analysis and GUI task. b. Analysis server executed UserPostLoop() each time a GUI client was disconnected. Disabled. 1. New script command line widget for GUI: Allows execution of ROOT commands or macros within Go4 GUI task. Moreover, Go4 hotstart scripts may be invoked here at any time. The widget offers a file dialog to search for *.C and *.hotstart files. It also has a selector dialog of preloaded commodity functions for histogram manipulation (rebinning, addition, projection, etc.). These function template calls may be completed with existing histogram names by dragging histogram items from the browser and dropping them on the empty command argument. The history of the command line may be saved to the current Go4 settings file .go4/go4localrc and is then restored on next startup. (See 6.17, page 81). 2. New GUI command interface class TGo4AbstractInterface. It can be accessed by handle "go4->" in GUI command line. This makes it possible to interact with Go4 GUI views and browser objects in a ROOT/Go4 script. Additionally, all remote analysis control commands are available here, like in the hot start scripts. Method reference of TGo4AbstractInterface is available in the Go4 help viewer (type "help" in GUI command line, or use Help►GUI commandline menu of Go4 main window). Example scripts using this interface are at $GO4SYS/Go4GUI/scripts (definitions of the preloaded command line histogram functions). Note: have been moved to $GO4SYS/macros in V3.2. 4. Plain ROOT canvases in files are better displayed. 5. New settings feature Settings►Preferences►Fetch when saving. If enabled, the save browser / save memory button of the file toolbar will refresh all browser item objects from analysis before saving. Thus the ROOT file will contain a snapshot of all analysis objects. Otherwise, only the already fetched objects are saved. 6. Zoom tools "set scale" dialog upgraded to non modal MDI widget. This will appear always on top of workspace widgets and refers to currently selected view panel pad. Changes include some bug fixes concerning the range settings of 2d histograms, and the auto-scale property. 7. MBS monitor tool: If monitoring switched on, calculation of rates is now done in Go4, averaged over update time. Parameters of MBS monitor are stored in Go4 settings file. a. Workaround for ROOT crash in histogram rebin editor: Selecting a histogram in view panel for rebin with the ROOT attributes editor leads to segmentation violation when original histogram was replaced or deleted. b. Crash in Go4 markers/conditions when histogram in view panel was replaced by drag and drop. d. Position and size of histogram statistic label may now be saved in Go4 picture objects. Thus these properties can be restored on Go4 hot start. g. Crash when FitPanel histogram under work was replaced or deleted in view panel. FitPanel did not react automatically on changes, happening with histograms (or graphs), displayed on view panel. Therefore, when superimpose mode was switched off, fitted histogram disappeared from view panel (and also deleted), while fitter still has pointer on that histogram. Now FitPanel slot in object manager registered also against all histogram, used in fitting. If histogram is deleted, FitPanel will be automatically refreshed. Redesign of the GUI with new internal object manager. Decoupling of controlling functionality from the Qt graphics layer. Effects many of the following features. New Go4 browser. Instead of several tabs for remote analysis, local memory, monitoring list, now one browser with sub-branches for different data sources, such as remote analysis, histogram servers, root files, is used. Supports local memory workspace folder with copy and paste by drag and drop, clipboard, and renaming. All controls available via right mouse button context menu. Switchable columns for object properties. Filter for monitored, fetched, and all objects. New view panel. Improved marker editor with lightweight condition editor. Additional options to display date and time of refresh, and full object path. Can display same object with different draw styles and ranges simultaneously. May store current setup as Go4 picture. New condition editor: More compact layout, shares functionality with view panel marker editor. Improved parameter editor: May display user parameter structure without loading the user analysis library into the GUI. Suppresses display of unknown components. New dynamic list editor: More compact layout. Automatic resolving of event name and data member name when dragging and dropping from analysis event structure, in case of pointer entry. Dito for tree name and draw expression in case of tree entry. New dockwindow for analysis terminal. If analysis is started in external shell, functionality of analysis output window (macro execution, etc.) shrinks to dockwindow. Improved dialogs for analysis startup and connection. Decoupling of libraries from GUI. GUI does not require all analysis libraries anymore due to changes in command pattern and dependency rearrangements. Will speed up GUI startup time and may reduce memory consumption. Status monitor for remote MBS node. New dockwindow offering connection to the mbs status port. Frequently update of daq rates and status possible. Trending histograms in browser workspace. Full printout of mbs status and setup structures possible. Go4 analysis status bar improved. Animated Go4 logo shows true running state of analysis, independent of current event rate. Current event source of first active step displayed per name in text field. Remote control of Go4 analysis from regular ROOT session. Command interface to connect and control analysis process from CINT. Inspecting and retrieving Go4 objects with extended root TBrowser possible. Go4TaskHandler redesign: Decouple client and server tasks from master and slave role. This implies that analysis can run in the network both as server or client task (as in previous Go4 versions). Vice versa, gui can run either as client or as server (previous behavior). Additionally, TGo4AnalysisClient class now inherits TGo4Slave (previously TGo4ClientTask), and TGo4Display inherits TGo4Master (previously TGo4ServerTask). One analysis server can be connected by many Go4 GUIs (one controller/administrator GUI, and several observer GUIs). Go4TaskHandler redesign: Password for login of master client to slave server with accounts for administrator, controller, and observer roles. Additionally, some Go4 commands are forbidden if master is logged in with a low priority account (observer e.g. may not reconfigure analysis, but only request objects for display). Default passwords may be changed in MainUserAnalysis code (see chapter 6.3.2 page 46). Go4GUI prepared to run with analysis server: Command go4 -client will start the GUI master task in client mode. In this case, the Launch analysis dialogue requests for login account, password, node and connection port of the analysis server. Moreover, a client GUI may first launch a new analysis server in an xterm and connect to it afterwards (see chapter 6.3.2 page 46). Example of analysis server in package Go4Example2Step: MainUserAnalysis may be started from command line with option –server as third argument (first arguments like batch, see 5.5.1,page 37), thus starting the analysis as server. Processing starts immediately (no submit from GUI necessary). Command line parameters of this example will set additional boolean arguments (servermode, autorun) of TGo4AnalysisClient constructor appropriately (see chapter 6.3.2 page 46). ROOT macro execution with Go4 analysis server: A Go4 environment and analysis server can be started from any ROOT session in the background (.x go4Init.C). Go4 GUIs may connect to this server and request data from running analysis macros, or control macro via Start/Stop buttons. New methods TGo4Analysis::WaitForStart() to poll for the Go4 environment running state, and TGo4Analysis::Process() to invoke the Go4 analysis loop explicitely from ROOT macro (checks also for STOP). Example macros hsimple.C, hsimplego4.C and treedrawgo4.C. See chapter 7 page 82. Analysis: UserPreLoop() and UserPostLoop() are only executed once when analysis running state is changing. In previous versions, each press on Start, or Stop button, respectively, would execute the corresponding method another time. Bugfix: postloop was called twice if analysis client was terminated in running state. Bugfix: MbsAPI/f_evt.c (close of streamserver). Bugfix: Labels for conditions and markers were not drawn correctly in logscale anymore for ROOT v>4.03/02. Keyboard shortcuts for many functions (see table chapter 11, page 92). Settings for Go4 GUI are now saved in the current directory by default in $PWD/.go4/go4localrc and $PWD/.go4/go4toolsrc, respectively. So different settings for the same login account are possible now. If the current directory does not contain a Go4 settings file on Go4 GUI startup, it will be created using the global account preferences at $HOME/.qt. Settings behavior can be changed using environment variable GO4SETTINGS. If this is set, the GUI preferences are used from directory $GO4SETTINGS. If GO4SETTINGS contains keyword ACCOUNT, the Go4 settings at $HOME/.qt are used (like in previous Go4 versions). New context sensitive menus (right mouse button popup) for all GUI browsers. ROOT object editor TGedEditor will show up in view panel side frame instead of top-level X-window. To implement this, the Go4 QtRoot interface has a new widget TQRootWindow which embeds a ROOT TGCompositeFrame into a QWidget. Superimposed drawn histograms, THStack objects and TMultiGraph will show a TLegend box in view panel. The legend box can be switched on or off by view panel menu. View panel marker editor: Added polygon shaped regions (TCutG). File browser: Added "Open remote file" functionality to read objects from TNetFile/XRootd (ROOT:), TWebFile (http:), and tape library (rfio:). Analysis browser: Objects may be protected against Clear() (histogram reset to 0), and against deletion in the analysis. Browser shows protection state in 3rd column as "C" and "D" symbols, respectively. Objects created from analysis code are always protected against deletion, objects created from GUI may be deleted from GUI again. Protection against clear may be changed using the browser's right mouse button menu. The protection state is persistent in the auto save file. Analysis: Histograms associated with Go4 picture objects will not appear anymore in the analysis Pictures folder, but only in the Histograms folder. Analysis macro: New analysis macro MainUserAnalysisMacro.C in directory Go4ExampleSimple. It needs a .rootmap file for automatically loading all necessary libraries. This file is created by the new files Makefile and Module.mk from the example. One can copy both files from the example, or modify existing files if they contain application specific changes. Look for map- expressions! New Method TGo4Analysis::Print() to print the current setup of the analysis and the steps. Multiple input file (metafile) for TGo4MbsFile may contain lines with CINT commands preceded by an "@" character. Commands, e.g. ROOT macro execution like ".x setup.C", are performed in between change of event source. Metafiles should have suffix .lml. Then they are recognized without @. The main programs in the examples have been modified not to add a .lmd to a .lml file name (update your main program accordingly!). TGo4FileSource: Partial IO functionality - name of the input event defines name of the tree branch to be read. Additionally, improved read performance for full event. New Example Go4ExampleMesh to show how to setup an analysis with non-subsequent analysis steps. May use partial input from tree branch. Reorganisation of Go4 make files and installation. Reduced number of Go4 libraries. Removed unnecessary ROOT dictionary information from libraries. Go4 may be installed without libASImage.so if this is not supported on the system. Implemented .rootmap mechanism to auto-load required Go4 libraries in macros. Bugfix: Preview panel options menu apply to all did not work for histogram statistics property. Bugfix: Double click in Go4 GUI browsers was not always working, because of conflict with drag and drop mode. Bugfix: When Submit was called without stopping the analysis before, references set in UserPreLoop() were not updated. Now UserPreLoop() is called also in this case. Additionally, UserPostLoop() is not called when analysis stops after initialization has failed. Bug fixes: A set of use cases has been set up to test the GUI functionality. Several bugs have been found and fixed performing these use cases. The test procedure has improved the stability of the GUI. It will be extended and used for all future Go4 updates. 1. Marker editor in view panel allows for marking channels or windows. Labels and arrows can be created. All marker elements can be saved and restored. 2. New ROOT graphical editor can be called from view panel. The editor dynamically adjusts to the graphical object selected by LMB. 3. View panel window title: can optionally be set by user and may be kept constant. If a TGo4Picture is displayed, the picture name defines the view panel title. 5. Condition, markers and labels: Implemented correct ROOT streamer (bug fix), i.e. saving and loading these objects to and from ROOT files is possible with fully recovered functionality and graphical properties. Support of pad display in linear and log scale (bug fix). Additional controls in RMB menu of ROOT (set ranges, location, save default properties, reset). Default label setup stored with Go4 GUI settings. 6. Polygon condition: Implemented statistics functions for work histogram under the cut (integral, mean, rms, etc.). Enabled InsertPoint and RemovePoint functions in RMB menu (bug fix). 7. Fit GUI: Selection between sigma and FWHM (default) by Settings►Recalculate gauss width. Fit results may be printed to terminal or Go4 log file output. 8. 1D drawing: ROOT "L" (line) "C" (curve) "B" (bar chart) "P0" (poly-marker) line styles supported. 9. Histograms: re-binning, projections, and profiles supported (standard ROOT methods with RMB). Automatic “synchronize with memory” on pad click to get newly created histograms. 10. Histogram client: monitoring implemented (auto-update). Drag and drop support. Display error message when server connection is not available (bug fix). Store server specification in Go4 settings. 11. File store: Storing objects into a ROOT file a title is prompted. This title can be seen in the Go4 browser and the ROOT browser. UserObjects folder. They can be located there by the standard Get methods, e.g. GetHistogram(). Editors work also with objects in these folders. Note: object names must be unique! 13. Log window: Empty messages are now suppressed (bug fix). 15. Thread manager: bug fix: adjusted default exception handling to work with newer libpthread.so that uses one process for all threads (e.g. FEDORA2). This lead to a crash when Go4 threads were canceled (shutdown of the go4 GUI). 16. Analysis Framework: bug fix: analysis without analysis step (UserEventFunc() only) again possible. 17. Client startup script: full PATH and LD_LIBRARY_PATH of the Go4 GUI environment is passed to the analysis process. 1. Keyboard shortcuts (Alt-1 to Alt-5) to select browser tabs (File, Monitor, Remote, Memory, Histogram client). Items are selectable with arrow keys (left-right to unfold and shrink subfolders). Return key acts as double click. 2. MBS event classes improvements: Method TGo4MbsSubEvent::IsFilled() checks if the sub-event was filled in the previous event built. Iterator TGo4MbsEvent::NextSubEvent() by default delivers newly filled sub-events only, suppressing existing sub-events in list of non used ids. Sub-event data field re-uses the memory allocated by libgsievent instead of copying it to own buffers. New method TGo4MbsEvent::SetPrintEvent() to set verbose mode for the next n events. Format changes in TGo4MbsEvent::PrintEvent(). 3. Performance improvements of analysis framework in step manager, dynamic list and MBS event classes. 4. New EventInfo toolwindow to control printout of an event sample in remote or local terminal. Optionally the user implemented PrintEvent() method, or the ROOT TTree::Show() output may be used. May control the arguments of TGo4MbsEvent::SetPrintEvent(). Supports drag and drop for event names from remote browser. 5. Display total memory consumption of histograms and conditions at the end of PrintHistograms() and PrintConditions() execution, respectively. 7. Analysis Terminal window: Limitation of text history buffer to 100 Kb by default, may be changed in settings menu. Disabled text wrapping in output for scrollbars. 8. Scale values dialog window extended by zmin and zmax fields. Allows setting minimum and maximum thresholds for channel contents of 2d histograms when auto scale is off. 11. Analysis configuration window: remember path to previous selected file in event source, auto-save, and preferences dialogs. Some layout cleanups. 12. Superimpose of histograms with same name from different files possible if overwrite mode is deselected in memory browser. Histograms will be copied to memory browser with cycle numbers added to names. 17. Bugfix: Double click on histogram in divided view panel did pop up this histogram magnified in a new view panel, but did not initialize view panel colours and crosshair settings correctly. 1. New Go4 Hotstart: The current setup of the GUI (analysis name and settings, view panel geometry, objects in memory and monitor browser, displayed objects in pads) may be saved to a hot start script file (postfix ".hotstart") from the Settings►Generate hotstart menu. The script name may be passed as argument on next Go4 GUI startup (e.g. "go4 mysetup"), which will launch the analysis and restore the settings (e.g. from file "mysetup.hotstart"). 2. New TGo4ExportManager class transforms and saves ROOT objects into other formats. Currently supported: plain ASCII (*.hdat, *.gdat) and Radware/gf3 (*.spe). An export filter is available in the GUI memory browser to save selected objects. 3. Redesign of Go4 Auto-save mechanism. Subfolders are mapped as TDirectory in TFile now, thus improving performance for large number of objects. Auto-save file is closed after each write, avoiding invalid file states in case of analysis crash. Dynamic list entries are saved as independent objects. 4. Example macro Go4Example2Step/convertfile.C converts all histograms and graphs from ROOT file into ASCII files, conserving the subfolder hierarchy. 5. New TGo4StepFactory class can be used as standard step factory to simplify the setup of analysis steps for small analyses. New example package Go4Example1Step shows the usage. 6. The TGo4Analysis class can now be used as standard analysis class. New example package Go4ExampleSimple shows the usage. 7. New view panel has size of previously active view panel. Default view panel starting size is stored in settings and recovered on next Go4 startup. 8. View panel: Switch on/off histogram title display in options menu. 9. View panel: Switch on/off crosshair for each pad in options menu. Default crosshair mode can be selected in main window settings menu and is saved and restored by Go4 settings. Crosshair mode button in condition editor has been removed. 10. View panel: Default background color can be selected in main window settings menu and is saved/restored by Go4 settings. 11. TCanvas objects in analysis task may be send and displayed on GUI. Works both for memory and monitoring list. 12. Support of TMultiGraph objects in analysis and GUI (display, memory and monitoring list update). 13. New draw option TASImage for 2 dim histograms in Go4GUI. May improve rendering speed for large maps when updating and resizing the canvas. Offers own palette editor in right mouse button popup menu. 14. Parameter editor: Added column to display the source code comments for each parameter class member as description. 15. Condition editor: General editor has button to create a new condition. New condition is defined in a dialog window and is put into general editor. May be sent to analysis for registration, or saved into a file then. All types of new conditions (window, polygon, array of these with variable size) are supported. 16. Object editors (condition, parameter, dynamic list) may save and load objects from/to ROOT files. 17. Status messages of object editors appear in bottom status line of Go4 main window. 18. Support of dynamic list entries in file browse: Editor opens on double click. 19. Histogram and Condition info windows: Object size now takes into account real data size on heap. 20. New analysis toolbar button for "re-submit and start" shortcut. Useful when file shall be re-read from the beginning after changing something in the setup. 21. Auto-save may be disabled completely from analysis configuration GUI. 22. New mode for TGo4MbsFile (*.lmd) wildcard/metafile input: Auto-save file may change its name whenever input file is changed. Name is automatically derived from input filename. Old behavior (one auto-save summing up all inputs) is still possible. This can be switched with method TGo4Analysis::SetAutoSaveFileChange(bool ). 23. End of .lmd file input gives informational message instead of error message. 24. Bug fix: avoid log-file crash when Go4 is started in directory without write access. 25. Bug fix in Go4 Mainwindow exit dialog. Exit via window "x" icon works properly now, too. 1. Histograms may be bound to conditions by method TGo4Conditions::SetHistogram(). The bound histogram will be fetched automatically in GUI whenever condition is edited. 2. TGo4Picture can contain conditions together with histogram objects. 3. General condition editor in addition to the condition specific editors. Supports drag and drop of condition icons and conditions linked to TGo4Pictures. 4. Warning label for unsaved changes in condition editor, and in dynamic list editor. 5. Condition editor cursor tab can make copies of the current cursor marker. For printouts with multiple markers. 6. Analysis log window in GUI displays date and time of last refresh. 7. New histogram status window, and condition status window in GUI. 8. Redesign of GUI object management: Added drag and drop support of TGraph, TGo4Picture from all browsers. Bug fix and improvements in histogram superimpose mode. 9. Monitoring list supports TGraph, TGo4Picture, and THStack. 10. Logfile mechanism for GUI actions. Log output configurable in Settings menu. Logging output on demand from condition editor, histogram and condition status windows. 11. View pane can turn on or off histogram statistics box. 12. View panel supports fix/auto scale modes for TH1, THStack, and TGraph objects. 13. View panel resize speed improved (redraw only at the end of resize action). View panel does not start in full screen mode anymore. 14. Analysis terminal: New buttons for clearing the terminal, PrintHistograms, PrintConditions. Command line has shortcut “@” for “TGo4Analysis::Instance()->”. “KillAnalysis” button buffered with confirmation dialog window. 15. “Quit Go4” button buffered with confirmation dialog window. 16. Dynamic list editor can change the global dynamic list interval for analysis. 17. Reorganization of GUI icons. 18. Performance improvements in TTimers of Go4 kernel: Removed Turn On/Off statements. 19. New method TGo4Analysis::NextMatchingObject() for search in analysis objects with wildcard expression. 20. Analysis: PrintHistograms(), PrintConditions() supports wildcard expressions for output list selection. 21. New methods: TGo4Analysis::StoreParameter, StoreCondition, StoreFitter, StoreFolder to write these objects into event store of an analysis step. Event number will be appended to object keys for parameter logging. 22. Consistency checks of analysis steps can be disabled by new method TGo4Analysis::SetStepChecking(bool). For setting up of non serial type analysis steps with own user management. 23. TGo4MbsEvent::PrintEvent() extended to display headers and also data field contents of sub-events. 24. New methods: TGo4MbsEvent::GetMbsBufferHeader(), TGo4MbsSource::GetBufferHeader() to access the buffer headers of list-mode files. Implemented example in Go4Example2Step. 25. Go4 GSI histogram server also exports TGraph objects as histograms (if possible). 26. Implementation of TGo4Condition::Paint() to display Go4 conditions in regular ROOT environment. Conditions may be drawn on TPad which already contains a histogram. New classes for condition painters and condition views. 27. Reorganization of the distribution make files. 1. New Package Go4Log to handle all messages and log file. This replaces the old package Go4Trace. Static method TGo4Log::Message(char*, ...) can be called everywhere to display text on terminal and optionally write to log file. Modified Go4 message prompt. 2. Header information of MBS list-mode data files accessible by new methods s_filhe* TGo4MbsSource::GetInfoHeader() and s_filhe* TGo4MbsEvent::GetMbsSourceHeader(). 3. Event source class TGo4MbsRandom to deliver random spectra into MBS events without connection to MBS node or reading list-mode file. Matches event structure of standard example Go4Example2Step. 4. TGo4Picture objects can be used in the monitoring list. 5. Changes in Analysis configuration window: Number of events, start/stop/skip events may be specified; tag file name and optional socket timeout. File browser for event source files. Auto-save interval now refers to time (seconds) instead number of events. Modified layout. 6. 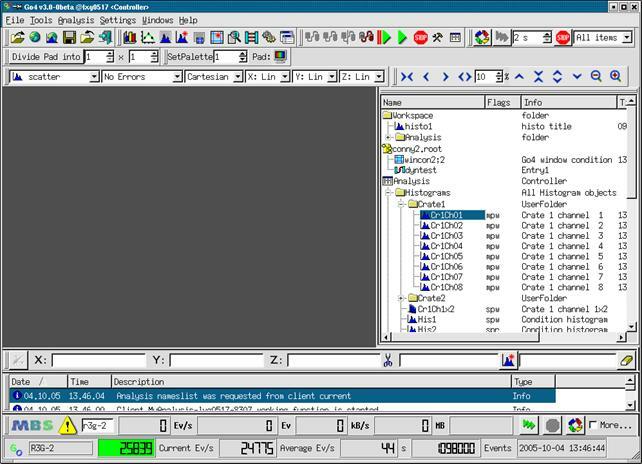 Dynamic list editor with button to PrintAll dynamic list entries on analysis terminal. 7. Improved postscript print dialog in View-panel menu. 8. Histogram client API supports conversion into Radware format. 9. Go4 histogram server supports float histograms. 10. Execution of ROOT interpreter commands / macros in the analysis task possible by command line in analysis terminal window. a. Display all conditions of array in different colors or hide them optionally. Visibility in editor is property of TGo4Condition and stored in auto-save file. b. Working view-panel pad and reference histogram of condition may be changed at any time. c. Clear counters button applies clearing to analysis condition immediately and refreshes editor from analysis. d. Statistics inside window condition limits (integral, maximum, mean, rms, etc) are calculated; these values are displayed in editor and may be drawn in labels on working pad. Methods to calculate statistical quantities belong to TGo4WindowCondition class and may be used in analysis, too. f. Extension of polygon condition /TCutG is calculated and shown like the borders of the window condition. g. Improved creation of new TCutG functionality. Assignment to current polygon condition may be cancelled. Handles pads with multiple TCutGs. 12. Added class TXXCalibPar to Go4Example2Step. Shows a procedure how to calibrate spectra using the Go4 fitter in connection with the parameter mechanism and an ASCII file “database” of line energies. 13. Make full screen default for new view panels. 14. When updating objects in Memory folder, a redraw is done automatically. 18. Some buttons on the browser pads have been rearranged to be consistent. On Memory browser pad the icons for "update local objects" and "synchronize with directory" have been exchanged to be consistent with Analysis pad. 1. TGraph objects can be registered and displayed correctly. Reset of TGraph (clear all points) by “eraser” button from GUI possible. 2. Reset/clear complete folders by selecting them in remote browser and “eraser” button. New method ClearObjects(“Histograms”) to reset all objects of named folder, e.g. all histograms at once. 3. “Print” button to printout histogram and condition lists with statistics in analysis terminal. These buttons are located in the dynamic list editor. 4. Parameter classes may contain TGo4Fitter* references or arrays of these. Fit GUI can be used to edit fitter from within parameter editor. Framework provides new class TGo4FitterEnvelope as example parameter. Example put into TXXXAnalysis. 5. User defined event source is possible. New class TGo4UserSourceParameter to be checked in analysis step factory for any kind of input. Example package Go4ExampleUserSource shows usage. 6. New class TGo4Picture to define layout of canvas with histograms. Pictures are registered in Go4 Pictures folder and stored in auto-save file like histograms; they can be displayed in any view-panel. Example added in TXXXAnalysis. 7. Possibility to register complete TCanvas objects in Go4 Canvases folder to be saved within auto-save file. Switch TGo4Analysis into ROOT batch mode to suppress drawing actions in analysis client while canvas is set up. 8. Go4 GUI can display and compare objects from different files in the same view panel now. 1. Possibility to select rsh or ssh and analysis output in Xterm or GUI window. 2. Wildcard in input lmd file names. 3. Input file name beginning with @ is interpreted as text file containing lmd file names. 4. An auto-save file can be written on demand (button in configuration menu). 5. Parameter editor. User parameter objects (subclasses of TGo4Parameter) registered in the analysis can be edited in the GUI by double click in the browser. Currently supported members are the primary data types and arrays of these. 6. New environment variable GO4USERLIBRARY can be set to a colon separated list of ROOT user libraries which are loaded automatically in the GUI. This is needed for editing parameter objects. 7. Dynamic lists. A dynamic list editor can be used to create/specify dynamic entries. A dynamic entry consists of a histogram (can be created new) and a member of an event object which shall be histogrammed. Optionally a condition can be added. The condition also can be created new. The event structure is expanded in the browser. Drag&drop is provided to select members. 8. The condition editor has been improved. Arrays are now handled properly. TCutGs for polygon conditions can be created new. 9. TGraph objects are supported like histograms. 10. In the Go4 view panel, the ROOT "event status" (cursor position) can be displayed. 11. The new fit GUI is available. It includes three different peak finders, a simple fitter, a wizard, and full access to all fitter components. Fitters can be stored/retrieved to/from files or memory. 12. User Makefile: the user executable need to be linked against the make file variable $(GO4LIBS) only, as defined in the Makefile.config of the framework (see Makefile of example Go4Example2Step). 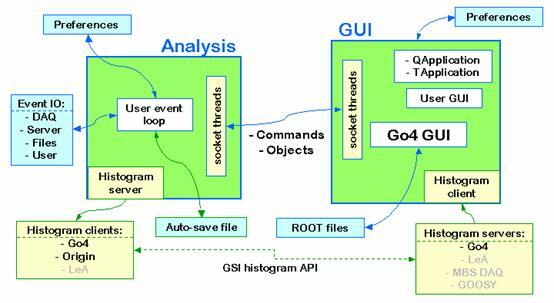 The Go4 (GSI Object Oriented On-line-Offline) Analysis Framework has been developed at GSI. It is based on the ROOT system of CERN. Therefore all functionality of ROOT can be used. 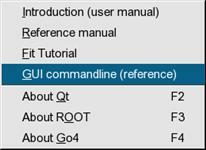 Go4 has two parts: the analysis framework itself and a Qt based GUI. Both can be used independently, or together. The separation of the analysis and GUI in two tasks is especially useful for on-line monitoring. The analysis runs asynchronously to the GUI which is (almost) never blocked. The same analysis can be run in batch/interactive mode or in remote GUI controlled mode. The GUI can be used stand alone as ROOT file browser and as histogram viewer for GSI standard histogram servers like MBS. Moreover, the analysis task can be run either as a client bound to one GUI (default), or can be started as an analysis server with the possibility to connect several GUIs (one controller and arbitrary number of observers with restricted commands). The Go4 framework handles event structures, event processing, and event IO. The analysis event loop is organized in steps: Each step has an input event, an output event, and an event processor. The output event calls the event processor to be filled. The event processor has also access to the input event. In the current design the analysis is data driven. A first event object (input1) is filled from some event source (input). An output event object (output1) is filled by an event processor object (process1) which has access to both, input1 and output1. Optionally the output event may be written to a file (file1). In the next step the input event object (input2) can be either the output event object (output1) from the previous step or retrieved from the file. The second output event object (output2) is filled by the second event processor object (process2) and can be optionally written to a second file. The information needed to create the event and processor objects (which are deleted when the event loop terminates) is stored in step factories which are kept in the analysis. The processor and output event classes have to be provided by the user. The input classes for standard GSI event sources are provided by Go4 (see chapter 4, page 21). Analysis and step factory classes are provided by Go4 or can be implemented by the user as subclasses. For normal operation, the Go4 analysis steps are designed to run subsequently. But in addition, each analysis step has access to the output events of all other previous analysis steps, so it would be possible to let analysis steps logically run “in parallel”, all starting with the output event of the first step, and all delivering their results to the last step that may collect and combine them. Outside the analysis steps the user functions UserPreLoop(), UserPostLoop(), and UserEventFunc() located in the user analysis class are executed as shown in the figure. In principle, they could be used to implement the full analysis without using the step mechanism. But for setting up a new analysis the use of steps is strongly recommended, because steps can be controlled by the GUI and offer event and IO management. In the event loop, after processing the steps and UserEventFunc() the Go4 dynamic list processor is executed. This processor can be dynamically configured from the GUI to check conditions and/or fill histograms. The Go4 concept consists of base classes (interfaces) for event structures, algorithms, and IO, which can be implemented by user subclasses or by framework plug-ins (general service classes) delivered with Go4. Class descriptions and reference guides are available on the Go4 Website http://go4.gsi.de. The interface classes provided by Go4 (a detailed description is in the reference manual) are normally not seen by the user. Starting with the examples (see chapter 5, page 30) one can better study derived working classes. TGo4EventElement: Defines the event structure and methods to clear and fill this structure. Input and output event structures of each step of the analysis are instantiated once at initialization. In the event loop the virtual methods Fill() and Clear() are used to update the event data. These methods can be implemented in the user subclass. By default, Fill calls BuildEvent of event processor. TGo4EventSource: The source of the event data. This can be e.g. a file of a certain format, or a socket connection to an event server. Usually, the event source class has a BuildEvent(TGo4EventElement*) method, e.g., which can be called by the Fill() method of the event object to be filled with the data. Therefore, event element and event source implementation classes have to “know” each other to perform a matching fill procedure. The class constructor should open (connect) the source; the destructor should close (disconnect) it properly. TGo4EventStore: An object responsible for storing the event data. This can be e.g. a local file of a certain format, but may as well be a connection to some storage device. The virtual method Store(TGo4EventElement*) is used to store the pointed event object. The class constructor should open the storage; the destructor should close it properly. TGo4EventProcessor: An object that contains the algorithm to convert an input event object into an output event object (both of class TGo4EventElement). This is a subclass of TGo4EventSource, since it delivers the filling of the output event from the input event. The event processor implementation has to “know” the input and output event classes. The methods of converting the data (i.e. actually performing the analysis) are free to be defined by the user. By default a BuildEvent method is provided. Simple examples of a running Go4 analysis can be found on directories $GO4SYS/Go4ExampleSimple, $GO4SYS/Go4Example1Step, and $GO4SYS/Go4Example2Step. Go4 offers predefined implementations of the event base classes, including an interface to the GSI data acquisition Multi Branch System MBS, the GSI list-mode files, and ROOT files. TGo4BackStore Use TTree existing only in memory to view and analyze event structures. These classes can be used directly to write simple analysis. The events in the ROOT file can be retrieved by program, but not in tree viewers. For the use of tree viewers, a new output event object should be filled and stored. As mentioned above a Go4 analysis is organized in steps. The information needed to instantiate a step is kept in the step factory. TGo4StepFactory This TGo4EventServerFactory can be used in most cases as user factory to set up the analysis steps (examples Simple and 1Step). TGo4AnalysisStep objects of this class hold the definition of an analysis step. Each analysis step has at least an input event object, an output event object and an event processor object. Additionally, it can have an event source (e.g. TGo4FileSource) and an event store (TGo4FileStore) instance. An analysis step is set up by a TGo4EventServerFactory subclass, i.e. TGo4StepFactory or a user defined subclass. Once the user has defined his/her event class implementations, the analysis steps can be created and registered to the Go4 analysis framework. The actual framework consists of the TGo4Analysis class, which is a singleton (i.e. there is only one framework object in each process). This class provides all methods the user needs, it keeps and organizes the objects (histograms,...), it initializes and saves the data objects. The user analysis is set up in a subclass of TGo4Analysis, i.e. TUserAnalysis. Constructor and destructor of this user class, in addition with the overridden virtual methods UserEventFunc(), UserPreLoop(), and UserPostLoop() specify the user analysis. If the latter functions are not needed, one can also use the TGo4Analysis class directly, as shown in the example Simple. In the constructor of the TUserAnalysis class the analysis step objects are created, each containing instances of its user step factory. The analysis steps are registered at the TGo4Analysis framework, input and output events of subsequent steps are checked for matching. Furthermore, other objects like histograms, conditions or parameters can be created in the constructor and registered, so the framework is responsible for their persistence. Such objects can also be created in the step processor. In addition to the event processors, the UserEventFunc() allows the user to specify analysis operations that are called once in each analysis cycle, e.g. filling certain histograms from the output events of all analysis steps. The UserEventFunc() makes it even possible to call an external analysis framework event by event without using the Go4 Analysis Steps at all, thus taking advantage of the Go4 object management and remote GUI features. The UserPreLoop() and UserPostLoop() functions may define actions that are executed before starting, or after stopping the main analysis loop, respectively. Once the user analysis class is defined, there are two modes of operation: The single-threaded batch mode, and the multi-threaded client mode that connects to the Go4 GUI. In batch mode, the constructor of the user analysis class (e.g. TUserAnalysis or TGo4Analysis) creates the framework. The InitEventClasses() method uses the factories of all steps to create the event classes and open the event sources, event stores, etc. It also checks for consistency of subsequent steps. 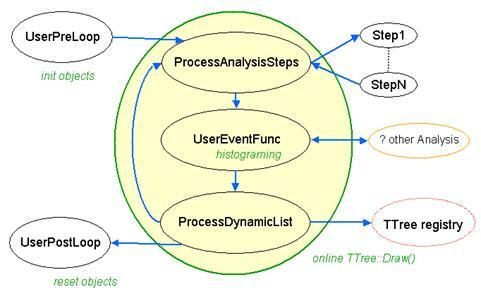 The RunImplicitLoop(Int_t n) calls the implicit event loop and runs the main analysis cycle (event processing of all enabled steps, UserEventFunc()) for n times. CloseAnalysis() deletes all event classes and closes all input/output files and connection. This method is complementary to InitEventClasses() that creates them. The destructor of the user analysis class calls CloseAnalysis(); in addition the auto-save file is closed and the complete framework is shut down. In the interactive GUI mode, the analysis framework is created with the user analysis class object, as for the batch mode. Additionally, the framework is handed over to a TGo4AnalysisClient object that manages the connection to the GUI. Usually, the Go4 GUI is started first and launches the analysis framework in a remote shell. The user analysis program is called in the shell script AnalysisStart.sh in the user's working directory. The working directory as well as the name of the executable is passed from the GUI side. Then the user executable creates the analysis framework and connects the multi-threaded analysis client to the Go4 GUI. After the connection is established, the complete analysis framework can be controlled from the GUI. After the example, we describe in detail what is happening on startup of the analysis client and what effect the GUI control actions have. As a default, the TGo4AnalyisClient object will set up the analysis-GUI connection in a way that the analysis is a single client to a single GUI as server, as described in section 4.5.2. However, it is possible to run the analysis as a server to connect many GUIs (one controlling GUI and many observer GUIs). Still the analysis class object is handed over to the TGo4AnalysisClient object, but the analysis “client” may run in a network server mode by constructor parameter (note: the classname TGo4AnalyisisClient was not changed for backward compatibility , although it should rather be called TGo4AnalysisSlave to point out the role as command receiving entitiy). The analysis server may be started independently from the GUI from a shell like in the batch mode, and may already start analysis run from preferences setup without any controlling GUI. However, it can as well be launched from the StartAnalysis dialogue of the Go4 GUI when selecting the mode “as server”. A Go4 GUI is ready to connect any such started server. Login of GUI to the analysis server may be with observer, controller, or administrator role, respectively; their passwords can be set in user analysis code. There can be only one controller or administrator, but multiple observer GUIs. Observers may only view exisiting objects, but may not modify them or change analysis setup and running state. Controller may view and modify objects and analysis configuration, but is not allowed to terminate analysis server. Only Administrator may shutdown the analysis server, too. Additionally, the analysis server may be launched first from one GUI in an xterm, and then connected from this GUI and other GUIs later on. See section 6.3.2 for more details on connection of the GUI client. The following examples show the essential structures to start/run the analysis. See also the running examples. These methods are available in TGo4Analysis and TGo4EventProcessor subclasses. Objects created in a TGo4Analysis subclass can be located in all event processors. Objects created in event processors can be located in all subsequent event processors (steps). Registered objects are stored/retrieved to/from the auto-save file, if enabled. Retrieval is done after creation of the analysis singleton before the creation of the steps. When an object retrieved from the auto-save file is created in a processor the retrieved object is replaced (stored data lost). When an object is created in the analysis singleton it will be replaced by the one retrieved from the auto-save file except histograms which are not retrieved in this case. This means that histograms created in the analysis singleton are always empty after startup. Parameters used in the analysis are implemented by the user in classes derived from TGo4Parameter. Such objects are registered to the framework and can be edited by a generic parameter editor (see chapter 6.11.2, page 74). Parameter objects can be created in the user analysis or the event processor class. Parameter objects are loaded from an optional auto-save file after instantiation of the analysis and before instantiation of the processor objects. When created in the analysis the values set in the constructor are therefore overwritten by auto-save. To use the GUI editor, the UpdateFrom() method must be implemented to update the local (active) parameter object from the modified one delivered by the editor. In this method it is up to the user to ignore certain members or to execute whatever he wants. E.g. one could use parameters to execute commands. Parameters in the auto-save file can be edited. In the editor they can be saved/retrieved to/from files. Several mechanisms can be implemented to handle the parameter member values. The main question is how restricted the methods of modification should be. Modify values only in the class constructor, then recompile. To prohibit changes by editor, the UpdateFrom() method could be just a no-op to avoid undocumented changes. The parameter object should be created and registered in the processor constructor (after possible auto-save restore). Pro: the parameter values are always strictly defined as coded. Con: the parameter values cannot be changed easily. Modify values by editor, use auto-save to store. Create parameter object in analysis constructor. Auto-save must be enabled. Pro: parameter can modified by editor (UpdateFrom() method must be implemented) and changes will be restored from auto-save. Con: when the auto-save file must be deleted for some reasons. the latest values are lost. Use a macro to set values. This macro must be executed in the processor constructor (after auto-save restore). UpdateFrom() could just execute the macro to avoid undocumented changes. Pro: values are kept in a text file and can be modified without recompile. Con: parameter cannot be changed by GUI editor. Best combination: one can use macro saveparam.C([file],wildcard,prefix) from $GO4SYS/macros creating macros (one per parameter) to set all parameters to their current values,. The names are built from prefix and parameter name. The macro can be executed in CINT (then the parameters are taken from a file), or in the GUI or in the analysis. The parameter is created in the analysis. Values are set from macro in processor constructor. By this method parameter values can be edited by GUI, or macro can be edited. Last version will be used independently of auto-save. Conditions are objects holding window limits or polygons. One or two values can be checked against the limits or the polygon, respectively. In addition the conditions have test and true counters. They can be set to return always true or false or return the inverted test result. They can be edited by the GUI (see chapter 6.8.2, page 67). They can be used to steer the analysis flow. They are saved/retrieved to/from the auto-save file, if enabled. They can be edited in the auto-save file. In the editor they can be saved/retrieved to/from files. If a mechanism like for the parameters (4) is wanted, one can use macro savecond.C([file],wildcard,prefix) from $GO4SYS/macros creating macros (one per condition) to set all conditions to their current values,. The names are built from prefix and condition name. The macro can be executed in CINT (then the conditions are taken from a file), or in the GUI or in the analysis. would produce macros setcon_cond1.C, setcon_cond2.C etc. The macros have three arguments: restore flags, restore counters, reset counters (0=no, 1=yes), e.g. setcon_cond1(1,0,1). in the current directory of the user analysis. Here the user may add his own initializations. The parameters analysis name and host name are taken from the launch client GUI panel, the port number is dynamical (displayed on GUI start-up in the shell, often=5000). Instead of launching the client from the GUI, one may start the analysis client manually from a separate shell (do not forget “. go4login” !) with the matching host name and port number for the running Go4 GUI. This can be useful if the analysis shall run under gdb, or if ssh/rsh fails for some reasons. and starts in server mode (see also 6.3.2, page 46). 3. TGo4Analysis is created and initializes the analysis framework. Then the constructor of the user subclass (e.g. TXXXAnalysis) defines the list of analysis steps with initial event parameters (input and output filenames) and auto-save settings just as passed from the MainUserAnalysis. Additionally, some user objects may be created and registered here. Note that histograms registered here are never updated or replaced from the Go4 auto-save file and exist only until the analysis client is terminated. Conditions and parameters, however, are updated when the auto-save file is loaded and if their name is existing there. 4. The analysis slave, if in client mode, connects to the Go4 GUI. Optionally, the Go4 histogram/object server is created. Note that the analysis in server mode does not connect automatically to the starting GUI, but waits for a separate connect request with login and password from any GUI. Only after this explicit connection the GUI in -client mode gets control over the analysis server! 5. The analysis settings are loaded from the default preferences file Go4AnalysisPrefs.root. A message is sent to the GUI: “Analysis Client MyClient: Status Loaded from file Go4AnalysisPrefs.root ” (if successful). Note that all settings specified before in the compiled code (auto-save file name, event sources, etc.) are overwritten if the preferences file exists. SetAutoSave(kFALSE), the auto-save file is not opened here even if it exists, and no objects are loaded! The “overwrite filename” option in the auto-save settings must be disabled to recover objects of a previous auto-save file; otherwise, all objects in an old file of the same name are lost! 7. The analysis settings are displayed on the GUI. At this moment, the analysis configuration window pops up and shows the active settings. Note that for GUI client at analysis server, configuration does not pop up automatically after login, but has to be requested by “arrow right” button of analysis configuration window. 8. End of analysis start-up. A message is sent to the GUI: “Analysis Client MyClient has finished initialization”. Note that now the analysis itself is not yet initialized, i.e. the event objects have not been created, and there are still no connections to event sources, etc. 1. Submit the analysis settings. The settings as displayed in the analysis configuration window are sent to the analysis client. i. First, an already existing analysis is closed (see below). ii. The analysis is initialized with the new settings. Objects are loaded from the new auto-save file except auto-save is disabled by SetAutoSave(kFALSE). The file name is as specified in the configuration window. iii. The event objects are created. Event sources and stores are opened. The constructors of all user events and event processors are executed. Note that any object (histogram, parameter, etc) which is created and registered in the user event constructors might replace an object of same name that was loaded from the auto-save file before! To continue working with the loaded objects, the user should request pointer to the object by name from the framework here. Only if the object was not found it should be created anew. After submit, the Analysis browser can be refreshed by . When an analysis was running before, the new analysis is started immediately and the refresh is done automatically. i. The Go4 GUI will send the start command and refresh the view in the analysis browser. ii. The UserPreLoop() function is executed once. Here transient pointers to data might be initialized, values from a user file might be read, etc. iii. The Analysis event loop is starting. For each event the analysis steps, the dynamic list entries, and the UserEventFunc() are executed. The loop will run until the event source is at the end, an error occurs, or the stop command is applied by the user. i. The event loop is halted. This will not close the analysis itself, i.e. all event objects still exist, event sources and -stores are still open. When restarting the analysis by , it will continue with the next event. ii. The UserPostLoop() function is executed once. Here transient pointers should be reset to 0, user files might be written or closed, etc. 4. Save configuration settings: At any time the current settings can be saved to a preferences file. This will not affect the running analysis. Note that after changing the settings in the analysis configuration window they must first be submitted to save them! 5. Load Settings: Loading analysis settings from a preferences file will immediately close the running analysis. The closing actions are just as described below. However, the loaded settings are not initialized until they have been Submitted again from the analysis configuration window! 1. The connection between analysis and GUI is closed. 2. The destructor of the user analysis class is executed. i. Objects are written to the previous auto-save file, if SetAutoSave(kTRUE). ii. The event objects are deleted. Go4 event sources (.lmd files and MBS connections) are closed. Event stores (.root files) are finally written and closed. The destructors of all user events and event processor classes are executed. All references to the event objects are deleted from the Go4 folders. iii. The dynamic list is reset. All pointers to non existing objects are cleaned up. 4. The analysis client executable terminates. The Go4 GUI is ready to connect the next analysis client. 1. Analysis server broadcasts message about shutdown to all GUI clients connected. The GUIs will cease monitoring activities and prepare for disconnect. 4. The analysis server disconnects all GUI clients fast, i.e. without handshaking protocol, and terminates. The output of this command would be helpful if you report problems. Copy the content of the directory $GO4SYS/Go4Example1(2)Step to a private one. You can directly make and run the example. · AnalysisStart.sh is the standard startup script for analysis client One may add here definitions needed by the analysis. · rename.sh is a script to set up file/class names. Note that "myname" will be part of all class and file names! Hint: do not use a string which is already in any filename! Shared library libGo4UserAnalysis.so and executable MainUserAnalysis should be created. Note: localhost should be listed here, since this is the Go4 default. Now login via ssh once to all nodes (including localhost) where you want to run Go4. Answer yes to continue. Then exit and try again. No more prompting should occur. Running Go4 (via GUI) on the node where the keys have been created one can use localhost as analysis node. On other nodes one must use the node name. When you are the first time on a machine, try to login via ssh to that machine using the node name. If there is a prompt, answer yes to continue, exit and retry. Only if ssh works without prompting you can run Go4 on that machine (via GUI). This package on Go4ExampleSimple contains a simple running Go4 analysis. It contains one analysis step. It uses the standard Go4 analysis classes TGo4Analysis, TGo4StepFactory and TGo4EventElement. Therefore the functions UserPreLoop(), UserPostLoop(), and UserEventFunc() are not available. No data can be stored in the output event. The example uses some conditions and some parameter objects. The step is reading events from a standard MBS event source filling some histograms. No output file is written. The analysis processes up to eight long word values from up to two sub events. A suited input file can be found on the Go4 web or “MBS Random” event source can be used. All classes are defined and declared in two files (*.h and *.cxx). Additional descriptions are in the source files. The events can be read from standard GSI lmd files or MBS or event servers. For each event the user event processor TXXXProc (function BuildEvent) is called. This user event processor fills some histograms. The macro MainUserAnalysisMacro.C can run directly in ROOT. It needs a .rootmap file for automatically loading all necessary libraries. This file is created by the new files Makefile and Module.mk from the example. The analysis, analysis factory, and analysis step (all standard Go4 classes) are created in the main program. The input is specified by a set of macros ( file.C, trans.C, stream.C, evserv.C, revserv.C). Other setups are done in macro setup.C. The macros are called in the main program by gROOT->ProcessLine. BuildEvent() - called event by event - gets the output event pointer as argument, but do not fill any data. The input event pointer is retrieved from the framework. In the first part, data from the raw input MBS event are copied to arrays of TXXXProc. Two sub-events (crate 1,2) are processed. Then the histograms are filled, the 2d one with polygon conditions. In this class one can store parameters, and use them in all steps. Parameters can be modified from GUI. If it is enabled all objects are saved into this ROOT file at the end of the event loop. At startup the auto-save file is read and all objects are restored from that file. When TGo4Analysis is created, the auto-save file is not yet loaded. Therefore the objects created here are overwritten by the objects from auto-save file (if any), except histograms. From GUI, objects are loaded from auto-save file when the Submit button is pressed. Note that histograms are not cleared. One can inspect the content of the auto-save file with the Go4 GUI. Note that appropriate user libraries should be loaded into GUI to access data from auto-save file (see chapter 6.2, page 45). All lines with **** are from the example classes. Most probably you will change TXXXParam to keep useful parameters. Then definitely you will change TXXXProc to create your histograms, conditions, pictures, and finally write your analysis function BuildEvent(). Before running MainUserAnalysisMacro.C in ROOT CINT it must be changed because all parameters are hard coded. This package on Go4Example1Step contains a simple running Go4 analysis. It contains one analysis step. It uses the standard Go4 step factory TGo4StepFactory, but a user written TXXXAnalysis. In this class the functions UserPreLoop(), UserPostLoop(), and UserEventFunc() can be used. It uses some conditions and some parameter objects. The step is reading events from a standard MBS event source filling some histograms and an output event. The analysis processes up to eight long word values from up to two sub events. A suited input file can be found on the Go4 web. All classes are defined and declared in two files (*.h and *.cxx). Additional descriptions are in the source files. The events can be read from standard GSI lmd files or MBS or event servers. For each event the user event processor TXXXProc (method BuildEvent()) is called. This user event processor fills some histograms and an output event TXXXEvent (raw event) from the input event. The output events can optionally be stored in ROOT files. When a ROOT file with raw events exists, it can be viewed by the Go4 GUI using the tree viewer. Note that appropriate library should be loaded into GUI to let the viewer know TXXXEvent (see chapter 6.2, page 45). In TXXXAnalysis the analysis step is created with the step factory and input and output parameters. Here the defaults are set concerning the event IO. Two parameter objects are created (TXXXParam and TXXXControl). The standard factory created in TXXXAnalysis keeps all information about the step. The TXXXEvent contains the data members to be filled in TXXXProc from the input event (MBS 10,1). The Clear() method must clear all these members (an array for each crate in the example). The analysis code is in the event processor TXXXProc. Members are histograms, conditions, and parameter pointers used in the event function BuildEvent(). In the constructor of TXXXProc the histograms and conditions are created, and the pointers to the parameter objects (created in TXXXAnalysis) are retrieved. Function BuildEvent ()- called event by event - gets the output event pointer as argument (TXXXEvent). The input event pointer is retrieved from the framework. In the first part, data from the raw input MBS event are copied to the members of output event TXXXEvent. Two sub-events (crate 1,2) are processed. Then the histograms are filled, the 2d one with polygon conditions. setfill.C(n), n=0,1 can be used in the GUI to switch the filling on or off. It creates macro histofill.C() which is actually used to set filling on or off (in TXXXProc). You can also modify histofill.C by editor before running the analysis. If it is enabled all objects are saved into this ROOT file at the end of the event loop. At startup the auto-save file is read and all objects are restored from that file. When TXXXAnalysis is created, the auto-save file is not yet loaded. Therefore the objects created here are overwritten by the objects from auto-save file (if any), except histograms. From GUI, objects are loaded from auto-save file when the Submit button is pressed. Note that histograms are not cleared. One can inspect the content of the auto-save file with the Go4 GUI. Note that appropriate user libraries should be loaded into GUI to access data from auto-save file (see chapter 6.2, page 45). Then you might change TXXXEvent to represent your event data. Keep the Clear() method consistent with the data members! pictures, and finally write your analysis function BuildEvent(). UserPostLoop () - called after event loop stopped. This example on Go4Example2Step contains an unpack step and an analysis step. It uses some conditions and some parameter objects. Step one is reading events from a standard MBS event source filling some histograms and an output event. Step two uses this event as input and fills another output event and some more histograms. The analysis processes up to eight long word values from up to two sub events. A suited input file can be found on the Go4 web. The events are read from standard GSI event sources (in the GUI one can switch to MBS or event servers). Then the first user event processor is called (Unpack). This user event processor fills some histograms and the first user event (unpacked event) from MBS input event. Then the second user event processor is called (Analysis). This user event processor fills some other histograms and the second user event (calibrated event) from the first event. The events from the first and second step can optionally be stored in ROOT files (from GUI). When a ROOT file with unpacked events exists, the first step can be disabled, and this file can be selected as input for the second step (from GUI). The main program builds the files names needed and creates the TXXXAnalysis. Then it either connects to the GUI (when started from GUI) or starts the event loop (when started from shell). If –server is specified, GUIs invoked by go4 –client may connect. 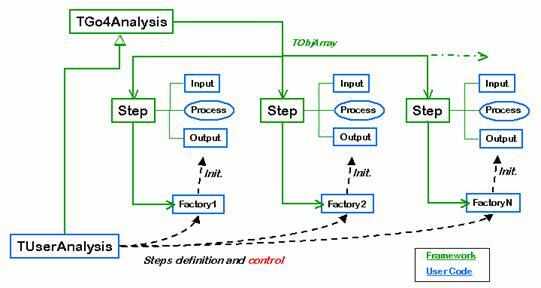 In TXXXAnalysis the two steps are created with their factories and input and output parameters. Here the defaults are set concerning the event IO. Two parameter objects are created (TXXXParameter). They can be used in both steps. The factory TXXXUnpackFact normally need not to be changed as long as standard GSI event sources are used. The TXXXUnpackEvent contains the data members to be filled from the input event (MBS 10,1). Only the Clear() method must be changed to clear all these members. The unpacking code is in the event processor TXXXUnpackProc. Members are histograms, conditions, and parameter pointers used in the event method XXXUnpack(). This name can be chosen by the user. In the Fill() method of TXXXUnpackEvent this method must be called. In the constructor of TXXXUnpackProc the histograms and conditions are created, and the pointers to the parameter objects (created in TXXXAnalysis) are set. XXXUnpack() - called event by event - gets the output event TXXXUnpackEvent as argument (poutevt). The input event is retrieved from the framework. The first eight channels of crate one and two are filled in histograms Cr1Ch01-08, Cr2Ch01-08, respectively. His1g is filled under condition cHis1 on channel 0, His2g under condition cHis2 on channel 1. When editing conditions cHis1,2 histograms His1,2 filled by channel 0,1 will be displayed automatically to set/display the condition values. Picture condSet shows histograms His1,2 on top, His1,2g at bottom. Open the condition editor in the view panel of the picture. Conditions cHis1,2 will be selectable. They are displayed in the pad where they should be set. Both conditions are attached to the picture (see chapter 6.8.4, page 69). Histogram Cr1Ch1x2 is filled for three polygon conditions: polycon, polyconar, polyconar, all on the same values as the histogram. The step two is build in the same way as step one. Note that the TXXXUnpackEvent is used two times: once as output of step one, and once as input of step two. Therefore the Fill() method checks if TXXXUnpackEvent has to be filled by XXXUnpack() in step one or retrieved from input file of step two which should be an output file of step one. Step one must be disabled in the second case. The user method XXXEventAnalysis() always gets the pointer to the correct event. Histogram Sum1 is filled by first 4 channels of crate 1 and first 4 channels of crate 2. All channels are gated with condition wincon1. Histograms Sum2,3 are filled similar, but without gate, and shifted by XXXPar1,2->frP1. Histogram Sum1calib is filled like Sum1 without gate but with values calibrated by method TXXXCalibPar->Energy() of parameter calipar. With the TXXXParameter class one can store parameters, and use them in all steps. Parameters can be modified from GUI by double click. In TXXXCalibPar is an example how to use fitters in parameters to calibrate histograms (more chapter 6.11.3, page 75). There are a few conditions created in TXXXUnpackProc. One (polycon) is used in XXXUnpack() for the accumulation of histogram Cr1Ch1x2. Another one (wincon1) is used in XXXEventAnalysis() of TXXXAnlProc to fill histogram Sum1. Conditions can be modified by double click in the browser. One can attach a histogram to a condition or attach conditions to picture pads to ensure that the condition is displayed/set on the proper display. This example on Go4ExampleMesh shows how to set up a Go4 analysis of several steps that build a mesh of parallel analysis branches with different result generations. Additionally, one can see how the improved TGo4FileSource class supports partial input from a ROOT tree. The setup of the mesh analysis is done in the constructor of the TMeshAnalysis class. As in the Go4ExampleSimple, the general TGo4StepFactory is used to specify the event objects by name and class name. An overall of 13 analysis steps is defined for this example. Generally, the analysis mesh consists in two different kinds of steps, the execution steps and the provider steps. The unpack step, however, is as in the other examples just delivering sample data from a TGo4MbsSource (standard Go4 gauss example). These analysis steps do the actual analysis work, i.e. they convert some input event into the output event. This is the same as in the more simple examples (2-Step). However, to realize a mesh structure, the execution steps do not work directly on their own input event as assigned from the Go4 framework, but use the input event of one or more provider steps. The execution steps can access the input event pointers of any provider step by the provider step name, using the GetInputEvent("stepname") method. Note that the native input event of the execution steps is never used here (except for the very first "Unpack" step that processes the initial MBS event directly, without a provider step). There are no histogramming actions in the execution steps. To view the result data one has to use a dynamic list histogram or perform a TTree::Draw on the output event's tree, if existing. - the provider step reads the input event directly from a branch of a ROOT tree (TGo4FileSource). In this case, the input event remains the native input event of this step as created in the step factory. - the provider step refers to the result event of a previous execution step. In this case, the provider processor itself has to find the correct event pointer by name from the Go4 object management. The default Go4 framework mechanism to handle these two cases will not suffice here, since it was designed for a subsequent order of steps and not for a mesh with parallel execution branches. To do this job, all provider steps use the TMeshProviderProc class as general event processor, and the TMeshDummyEvent class as pseudo output event. The TMeshDummyEvent is necessary, because the Go4 framework will always call the Fill() method of the step's output event to execute any action of the step. So TMeshDummyEvent::Fill() calls method TGo4ProviderProc::SetRealInput() to set the pointer to the desired input event correctly. If the input event is not read from file (native input event of this step), the provider processor has to search for it by name using the method TGo4Analysis::GetEventStructure("name"). However, the Go4 framework so far does not offer any additional parameter to specify the name of the appropriate input for a provider step. Therefore, this example uses the trick to derive the event name search string from the name of the provider processor itself: the name of this processor (up to the "_") is the name of the required event. Note that TGo4StepFactory forbids to use same names for different objects, since the object name is used as pointer name in the ProcessLine() call; therefore the processor name can not be identical with the input event name, but must differ by the "_" extension. Additionally, the provider steps use the new partial input feature of the TGo4FileSource class (since Go4v2.9). The name of the event structure defines the name of the TTree branch that should be read from the input file. The first three provider steps use different parts of the TMeshRawEvent each. If the input event name is set to the name of the corresponding tree branch (e.g. "RawEvent.fxSub1"), the file source will only read this branch from the tree. If the input event name is set to the full name of the raw event ("RawEvent", commented out in this example), the complete event is streamed, including the not used parts. Note that in both cases the event object must consist in the full TMeshRawEvent, although in the partial input case only one sub-event is filled. This is required for a proper event reconstruction due to the ROOT TTree mechanism. In this example, the partial event input might increase the process speed by a factor of 2 compared to the full event input. Although the step configuration can be defined as usual from the analysis configuration GUI, not all combinations of enabled and disabled steps make sense to process a subpart of the complete analysis mesh. For example, if execution step 2 shall be processed, the corresponding provider step for its input event has to be enabled, too. Note that the standard step consistency check of the Go4 framework is disabled here to run such a mesh at all (SetStepChecking(kFALSE)). So it is user responsibility to ensure that all required event objects are available for a certain setup. Moreover, with >13 analysis steps the standard analysis configuration GUI becomes quite inconvenient. Therefore, the example uses a Go4 parameter TMeshParameter for the easy setup of the configuration. This parameter has just a set of boolean flags to determine which execution step shall be enabled. Depending on this setup, the UpdateFrom() method of the parameter also enables or disables the required provider steps. However, the parameter does not contain the full information of the input file names for the providers yet (In a "real" application, this could be implemented in a similar way though). Thus the configuration procedure looks like this. The TMeshParameter is edited on the GUI to enable the desired execution steps. The parameter is send to analysis and switches the steps on and off. Then the analysis configuration GUI has to be refreshed by the user pressing button to view the new setup. Here the user may change the names of the event sources for the provider steps, if necessary. After submitting these settings again from the configuration GUI, the mesh setup is ready. Note that once the mesh is configured in this way, the configuration can be stored completely in the analysis preferences and restored on the next startup. One could also think of a user defined GUI that handles both the setup of the TMeshParameter, and the rest of the analysis configuration in one window. This would offer the additional advantage that it could show the structure of the analysis mesh in a graphical way. However, such a user GUI is not delivered here, but can be created according to the hints given in package Go4UserGUI (see chapter 6.16, page 80). Enable the first unpack step, disable the rest of the mesh. Use TGo4MbsRandom as event source for the Unpack and fill the output event TMeshRawEvent into a ROOT tree (switch on TGo4FileStore of unpack step). Do this until a reasonable number of events are processed. Disable the unpack step, enable one or more of the subsequent execution steps. The input for the first 3 provider steps should be the ROOT file that was produced before. Note that the first providers could also read their sub-events from different files. Eventually, produce further output trees from the execution steps. Change the setup in a way that only one branch of the mesh is processed, e.g. only Exec3 and Final. Change the setup in a way that only a certain generation of events is processed, e.g. only Exec1, Exec2, and Exec3, writing output files of their results. Alternatively, let only Exec12 and Final work, reading their provider inputs from these output files. Change the example code and recompile to add another execution branch, e.g. with new steps for InputProvider4, Exec4, OutputProvider4, and collect the results in the existing final step. New classes TMeshB4InputEvent, TMeshB4AnlProc, and TMeshB4OutputEvent should be defined for this (these can be derived from the corresponding classes as existing for the Exec3 branch). Create a new mesh analysis from this template that matches your analysis structure. The following picture shows the GUI with all elements. On the right side you see the Go4 browser. The left side will be the display panel. Below is the Tree viewer, and under this the message window, the mbs monitor, and the analysis status display. With Show/Hide in the Settings one can configure the layout and save/restore it. All buttons in the top row are also available as pull down menus commands. There are several screen movies on the Go4 web showing the use of the Go4 GUI. There are many keyboard shortcuts to handle windows and actions. See chapter 11, page 92. The icons in the top line are grouped into three segments corresponding to the first three pull down menus File, Tools, and Analysis. Disconnect Analysis: remove connection without analysis server shutdown. Shutdown Analysis server: in administrator mode only! The help menu provides manuals on-line. In the Settings pull down menu as shown on the left side one can set Fonts and Style, Preferences and Panel defaults, where one can set the histogram Statistics box and view panel layout. Preferences specifies when objects are fetched automatically from analysis. You can adjust all fields according your needs. Then Save Settings. The next start of the GUI will restore the saved layout. Note that settings also contain other preferences, like window geometry and tools visibility, view panel background color and crosshair mode, graphical marker appearance, connection setup parameters, etc. By default, the settings are stored in text files ./.go4/go4localrc and ./.go4/go4toolsrc. To get the standard setup one may delete these two files. If the current directory does not contain a Go4 settings file on Go4 GUI startup, it will be created using the global account preferences at $HOME/.qt, or from the standard installation settings. Settings behavior can be changed using environment variable GO4SETTINGS. If this is set, the GUI preferences are used from directory $GO4SETTINGS. If GO4SETTINGS contains keyword ACCOUNT, the Go4 settings at $HOME/.qt are used (like in previous Go4 versions). With the Show/hide entry of the settings menu (or with RMB in an empty menu region) one gets the window on the right to select which tools shall be visible. The actual content of these windows is preserved even if they are not displayed. This is also available as popup menu when clicking the right mouse button on an empty field of the main window. The Log actions of the GUI can be defined in a setup window from the settings menu. By default, the log output (e.g. condition properties, histogram information) is printed into the shell window where the GUI was started from. Additionally, a text file may be specified for output. Logging mode specifies if log output is produced On demand only (i.e. on clicking the log button when available), or Automatic whenever the content of an editor/information window changes. Priority defines the level of output suppression: Errors, Warnings, Infos, or Debugs. Level Errors will only log in case of an error, Debugs will printout even debug information of the Go4 kernel. This reflects the priority of the TGo4Log::Message() method. In the Panel defaults►Canvas color menu the default background color for all newly opened view panels can be set. This color may be saved together with the other settings. Panel defaults►Marker labels specifies the default label layout. The Crosshair mode entry toggles the default crosshair cursor on/off for all newly opened view panels. This crosshair state may be saved together with the other settings. However, the crosshair can be switched independently for each pad in the menu of the view panel (see chapter 6.7, page 59). The Generate hotstart entry will save the current state of the GUI (window geometry, objects in memory and monitoring list, objects in view panel, analysis settings) to a Go4 hot start file (*.hotstart). The name of the hot start file can be defined in file dialog here. When re-starting the Go4, the hot start file may be used as command line argument, restoring the state of GUI and analysis (see chapter 6.15, page 80). With Terminal history the buffer size for the analysis output window can be limited. The Windows pull down menu shown on the right side provides items to arrange the windows and to save and clear the analysis and log windows. To access data from user defined classes (like parameters or events) a library including the ROOT dictionary is required. This library is produced by the make file and has the name libGo4UserAnalysis.so. It is recommended to load user libraries for non-Go4 classes (for instance, user event classes) before opening a file with a TTree, where object of these classes are stored. There are three different ways to do it. First, any external shared library (with or without ROOT dictionary inside) can be loaded by press of the button on the main window. A file dialog then asks to specify the library to be loaded. Third, the new possibility (since ROOT 4.00/08) for automatic load of libraries with a .rootmap file. This file contains information to automatically load all necessary libraries for user classes. All make files of the Go4 examples generate .rootmap files during compilation. To explicitly generate this file again, type make map after compilation. If this file is located in the current directory (where GUI is started) or in the user home directory, all libraries will be loaded automatically at the time when required. For more details about .rootmap files see the ROOT home page. Press the button (or Alt a n or Strg n). This will start the Launch analysis window to execute the analysis task on another host. The operation mode of the analysis task may be “As client” (default), or “As server”; this has to be specified in the selection box on top of the Start Anaylsis window. The difference of these modes is that in client mode the analysis connects as client to the starting GUI and will be finished when the Go4 GUI terminates. There can be only one GUI connected to an analysis in client mode. The starting GUI will connect automatically to the analysis client after launching it with full controller priviliges. In contrast to this, the analysis started “as server” will be an external process independent of the starting GUI. Therefore in server mode the analysis can not run embedded into the Qt Window of the GUI. Any number of Go4 GUIs may connect to this analysis server with different priviliges, but only one GUI may be the authorized controller. Especially the starting GUI has to login to the analysis server after launching it in a separate dialog window.